Atlanta, GA (Restaurant News Release) Moe’s Southwest Grill® is rolling out a new menu offering for those looking for more health conscious options – the Quinoa Power Bowl. The bowl packs all of the Southwest flavor that Moe’s is known for with higher protein and fiber and lower carbohydrates. 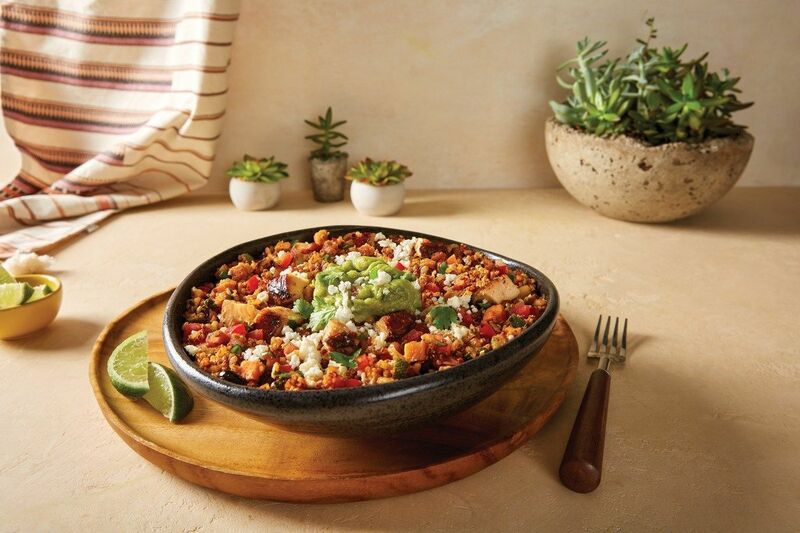 Today, the new bowl will roll out nationwide across the Moe’s portfolio of more than 700 restaurants, making Moe’s restaurants the first to launch a quinoa bowl in the Mexican fast casual segment. The Quinoa Power Bowl is made with Mojo Chicken (all-natural white meat chicken breast), quinoa blend (quinoa, brown rice, sweet potato and zucchini), frijoles, shredded romaine lettuce, corn pico, guac, cilantro and queso fresco. Fans can also grab the quinoa blend as a side or an addition to other menu items. With the addition of the Quinoa Power Bowl, Moe’s restaurants are a one-stop source for groups, even those with special diets. Whether group members are in search of vegan, vegetarian, keto or gluten-friendly meals, everyone can look forward to the special “Welcome to Moe’s!” treatment along with the brand’s variety of menu options. The Quinoa Power Bowl is the first menu innovation to be rolled out from The Oasis, the brand’s Atlanta-based test kitchen and new prototype. The product launch will be followed by other culinary creations in the coming year as part of the brand’s deeper dive into Southwest flavors. Welcome to Moe’s!® Founded in 2000 and based in Atlanta, GA, Moe’s Southwest Grill is a fast casual restaurant franchise that serves high quality and fresh Southwestern food. Moe’s has an extensive variety of menu items to please the entire family. Whether you visit one of our 700 franchised locations or have us cater your next event, free chips and salsa come with every order. Moe’s Southwest Grill has been recognized as the Brand of the Year in the Fast Casual Mexican Restaurant category for two years in a row based on the 2016 & 2017 Harris Poll EquiTrend® Studies. Check us out online at www.moes.com to find a store near you, and then connect with us on Instagram, Twitter and Facebook.